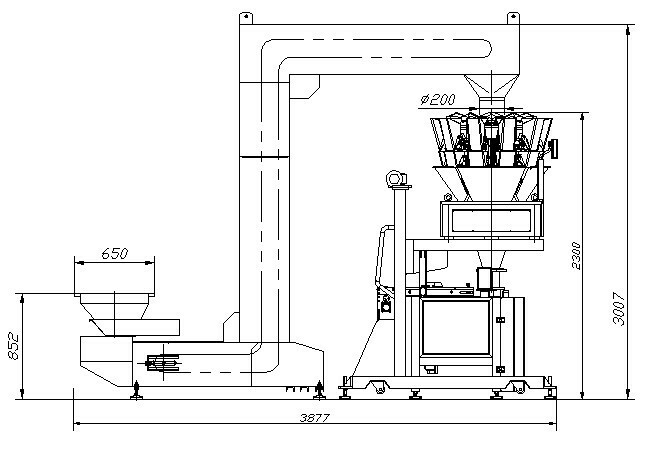 ZETA-M VFFS SYSTEM IS THE BEST SOLUTION FOR BAGS AND POUCH FORMING AND FILLING PACKAGING EQUIPMENT. COMBINE ALL TOGETHER IN ONE MOBILE PACKAGING SYSTEM: AUTOMATIC VFFS MACHINE, LIFTER PLATFORM, MULTIHEAD WEIGHER AND SUPPORTING EQUIPMENT . Free Flow Powders: Sugar, Salt, Pepper, Spices, Flour, Coffee, Milk powder, various sorts of powders, etc. Granules & Seeds: Coffee beans, Cocoa, Rice, Sesame, Seeds, Small Granules, Nuts etc. Dry, Frozen & Processed Foods: Snack foods, Cereal & Health Foods, Confectionary, Biscuits & Bakery, Pasta, Nuts, Dried fruits and vegetables, Frozen Vegetables, Dried Mushrooms, Pet Food, etc. Non-food: Detergents, Plaster, Talc, Chemical additives, Small metal/plastic items, Bolts, Washers, Auto, Electrical and Plumbing Parts etc. * The newest popular compact design with very strong construction. * Film pulling system controlled by servo motor. * New compact design allows more application and saving rooms. * The way of bag making: the machine can make pillow-type bag and gusset side bag, pouchs bag or according to customer’s requirements. 2. Bucket elevator Z type. Further more, you can move this mobile unit from one to another production shift without delay.